Molecular electronics is a developing research area where scientists learn about electrical properties of the molecules with a chemically programmed function. Molecules are capable of functioning as switches, diodes and transistors, all with a distinctive length of few nanometers. The very first switchable molecular diode has now been developed by an international group of scientists from University of Bern, Leiden University, Delft University of Technology and Chuo University. Diodes are considered to be basic electronic components capable of conducting electric current in a single direction. Researchers from the Department of Chemistry and Biochemistry of the University of Bern (Dr. Veerabhadrarao Kaliginedi, PD Dr. Peter Broekmann) and Leiden University (Prof. 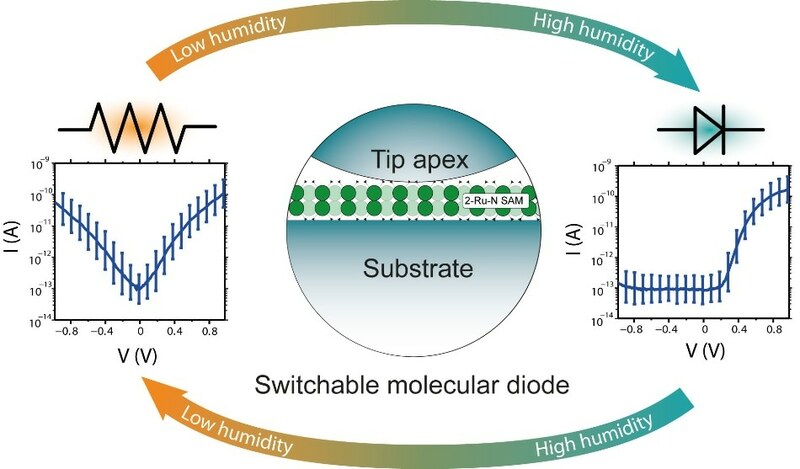 Sense Jan van der Molen’s Group) along with colleagues from TU Delft (Prof. Joseph M. Thijssen’s group), and Chuo University (Prof. Masa-aki Haga’s group) have recently demonstrated the very first switchable molecular diode. This molecular diode is capable of being turned on and off via humidity and vice versa it is a humidity sensor at nanoscale. The results were recently featured in "Nature Nanotechnology". The team discovered that the electric conductivity of the dinuclear ruthenium organometallic complex molecule "2-Ru-N" relies on humidity. Under dry conditions, the similar amount of current flows via the molecule under negative or positive voltage. This indeed changes dramatically in a humid environment. Only a positive voltage induces a current in that case. With this, the researchers have developed a molecular circuit that functions as an exceptional combination of a switch and a diode: a switchable molecular diode capable of being turned on and off with humidity. Vice versa the molecule aids as a humidity sensor based on the structure of a particular molecule. The small diode works by means of an asymmetry brought about by water molecules at the molecular junction interface. Water molecules lump together at tip side of the molecular layer at around 60% humidity, causing an imbalance between the energy levels on both sides. This intensely restricts the flow of electrons. The molecule’s symmetry does not break and the diode behavior disappears under dry circumstances. The whole principle is based on symmetry, so it doesn’t exclusively apply to water. In theory this concept also works with for alcohol or toxic gases, for example. This explains the fact that the discovery does not only relate to measuring moisture in the air. The main benefit linked with the molecule based sensors refers to their tiny size (meaning that the device size can be very small) and chemical tunability for varied sensing applications. If scientists find a suitable molecule in the future consisting of two symmetric halves with energetically coupled functional groups sensitive to other external stimuli, just as "2-Ru-N", the principle enables other sensors too, like a molecular alcohol test or toxic or explosive chemical detector.